Our signature Afternoon Tea is an elegant blend of Chinese black tea, oolong and jasmine-scented green tea, with flavours of bergamot and a flamboyant flourish of pink and white petals. 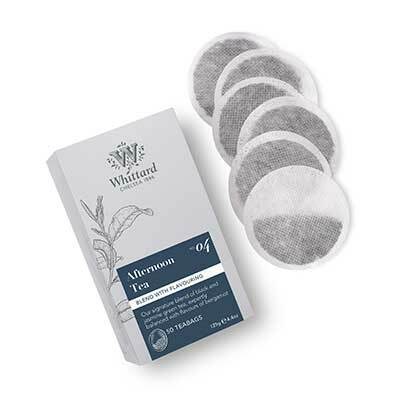 The rich black tea blends beautifully with the refreshing floral taste of the green, while the hint of bergamot creates the lightest suggestion of an Earl Grey. Highly satisfying unique blend. It takes a special effort and attention to get a great brew with the afternoon although for the traditional aficionado the afternoon tea has something to liven up a supermarket PG tips mug or a seated gathering of scones. This is a fantastic homage to blends of the past and a lighter and delightfully varied alternative to a standard black tea. Beware, if you are enjoying this tea loose leaf be mindful that a teaspoon may account for an unfair taking of the following ingredients: Bergamot, green, jasmine, oolong and black tea. Aptly suited for the afternoon, just take care in preparation, do not add too much, do not leave in for too long and be mindful of scolding the jasmine or green tea. Tastes like normal earl grey with too much bergamot. It is nothing like the loose tea that I love and have ordered twice now. I live in Germany and delivery takes up to 10 days so my disappointment was big when I discovered that the loose tea and the tea bags have a different blend. I need to read the ingredients next time first so I won't be negatively surprised. We’ve given this blend the number 4 as the perfect time for tea. Now who’s for a cucumber sandwich?